Clarendon Chess Open: Pitterson wins! 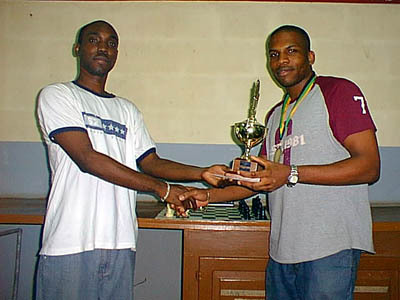 Peter Myers, "Pitterson takes Clarendon Chess Open," 4 November 2004 (Clarendon, Jamaica). Jamaica's National Champion Warren Elliott presenting trophy and check to tournament winner Jomo Pitterson. National Master Jomo Pitterson scored a perfect 4 points from 4 games to win the 2004 Clarendon Chess Open, which was held at the Glenmuir High School over the weekend. The tournament was organized by the Clarendon Chess Association (CCA) under the auspices of the Jamaica Chess Federation (JCF). Pitterson topped the Open section ahead of the National Master Mark Smith and National Junior Champion Brandon Wilson, who both finished on 3 points. The Under 1800 section was won by Campion College's Christopher Buchanan who finished with 4 points from 4 games, while five players tied for second on 3 points, they included Walter Williams, Charles Ross, Mikhail Solomon, Bryan Pryce and Shandar Sybron. Williams received the award for being the top player from Clarendon. In the category for unrated players, 10 year-old Jamel Pencil of Clarendon took the top award after finishing unbeaten on four (4) points. Noel Richards took second place, while Onaje Lamont took the third place award. The two-man team tournament was won by the combination of Pitterson and Buchanan who had a combined score of eight (8) points.